Rail companies and politicians have been urged to stop blaming each other and put customers first when services are delayed or cancelled. An assembly committee made the plea in its report into the serious rail disruption last autumn. At one point, the Transport for Wales (TfW) train fleet was reduced to 86 from a total of 127. Tory AM Russell George said "finger pointing in these situation does little good". 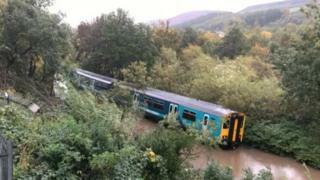 James Price, chief executive of Transport for Wales, said it was working hard to avoid a repeat of the situation. Shortly after TfW took over the Wales and Borders services the operator cancelled a large number of services. It said the measure was necessary to repair trains damaged by Storm Callum. TfW went on to criticise the maintenance record of the previous licensee Arriva Trains Wales - criticism strongly rejected by the firm itself. The Welsh Government, which took over the management of the Wales and Borders franchise last year, also blamed UK ministers for under-investment in the network. The economy committee report said that while the adverse weather did account for some loss of capacity on the network, it did not account for the "particularly severe level of disruption experienced by rail passengers". Committee chair Mr George said: "Finger pointing in these situations does little good and we believe all parties involved should pull together to deliver the high standard of service Welsh commuters deserve. "We were told... it was simply a combination of Storm Callum and under-investment in an ageing fleet of trains." But he said it turned out to be "rather more complicated", with an independent report highlighting a number of possible causes and remedies. A key cause of the disruption was fallen leaves and adhesion, where leaves stick to rails and trains compress them as they pass which reduces grip. This can lead to what is known as wheel flats, where the train's wheels slide, rather than roll, on the rails and it flattens sections of the wheel. In severe cases it can cause damage to tracks and trains. But the committee was told by Network Rail that the autumn conditions were similar to last year's. The committee also heard evidence that Wales has received less than its fair share of funding from the UK government when it comes to upgrades to the track and new infrastructure. It said so-called enhancement spending remains a concern for the committee, and it will continue to keep a watching brief on this. AMs said more could have been done at an earlier point to improve the capacity and quality of the Welsh fleet of trains. "There have clearly been difficulties in the relationship between the UK and Welsh governments," the report added. "But unfortunately the real losers in all this have been rail passengers. We believe passenger interests have to some extent been lost in discussions between the governments." James Price, chief executive of Transport for Wales, said: "We absolutely recognise the impact that our autumn period had on our customers, and are working hard to ensure that we do everything possible to avoid a repeat of similar issues in 2019." Welcoming the report, he added: "We are continuing to finalise our detailed investigation into autumn issues with Network Rail, and will be publishing our full report shortly." He said the organisation will continue to deliver investments in rolling stock, including Wheel Slide Protection technology to reduce the impact for customers during Autumn. A UK Department for Transport spokesperson said: "As this report makes clear, we have increased spending on rail infrastructure in Wales in recent years. This includes delivering electrification of Great Western route to Cardiff and contributing significantly to the cost of the Cardiff Metro scheme." A Network Rail spokesperson: "We recognise that the service passengers experienced this autumn was not good enough and we are working hard with Transport for Wales to make sure people do not experience a similar level of service disruption this year. "We welcome the committee's report, and will continue to work closely with our partners, Transport for Wales, ahead of the next autumn season. "As the committee recognised we will invest a record £2bn in the Wales and Borders rail network over the next five years. As part of this, we will be investing an additional £27.7m in extreme weather resilience, improving reliability for passengers and our freight customers."